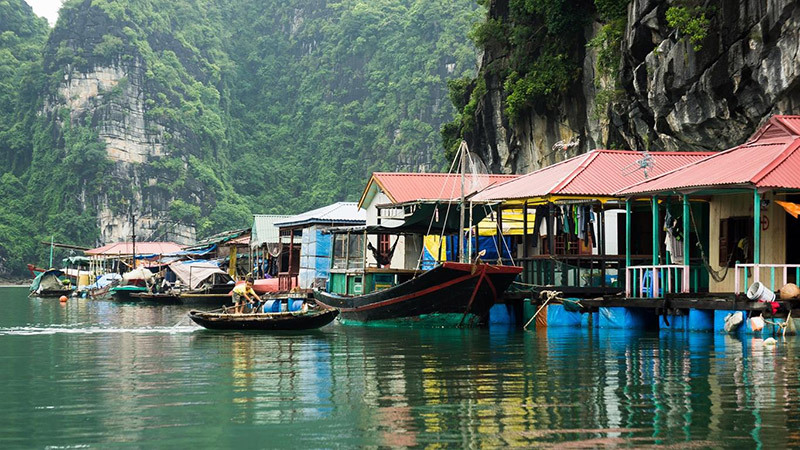 NDO – With around 400 islands covered with diversified species of plants, Lan Ha Bay in Cat Ba island district, in the northern port city of Hai Phong, has risen to become a “second” Ha Long Bay of Vietnam on the tourist map. Together the islands of Lan Ha Bay are recognised as a lively natural museum which illustrates the erosion of sea water through a long geologic period. The 400 rocky islands were crafted and sculptured by Mother nature into lagoons and small bays which are home to many caves, a majority of which have not yet been discovered. Each name of the islands and caves across Lan Ha bay implies its own natural shape and features, such as Khi (Monkey) island, Doi (Bat) island, Ham Rong (Dragon Jaw) cave, Sang (Bright) and Toi (Dark) caves. In summer, in a natural tranquil and romantic landscape of the bay, which is named after a lovely flower, vacationers can swim in crystal clear blue water on 139 white sand beaches across the bay or go diving to explore the colourful coral reefs in Van Bo and Van Ha beaches. Meanwhile, autumn and winter also provide visitors with interesting experiences through excursions to caves, sailing and kayak trips. Visiting the bay during the two seasons, tourists can feel relaxed and closer to nature as they can hear the sound of waves splashing day and night at the foot of the cliffs islands and the amazing singing of natural birds from bushes amidst the setting sun glittering on the waves far far away. Lan Ha Bay is most visited by international visitors during the transitional season between winter and spring when they can admire the poetic and magnificent beauty of the natural museum. Many lovers of adventure tourism take kayak trips to thread through the caves, while others decide to spend their holiday on cruise ships. There are currently dozens of luxury cruise ships operating on Lan Ha Bay, which depart from Ben Ben wharf, 45 minutes from downtown Cat Ba town. During the tour, the cruise liners drop passengers in several stops such as Cai Beo and Van Gia fishing villages, Nam Cat island, Van Boi Con island, and an organic farming area. Visitors can hire kayaks to visit households in the fishing villages, floating class rooms and Sang (Bright) cave, which serves as a safe shelter for fishermen during rainy season. The cave is also home to many mysterious and stunning stalactites. Another highlight of the tour is Quan Y (Military Hospital) cave, which has an interesting story behind it. The cave was used as a kind of a bunker hospital during the anti-US war with concrete cells inside, and tourists can stand on the cliffs with an amazing view. Thanks to its pristine scenery and natural charm, Lan Ha Bay has magnetised many holiday makers from home and abroad.